MEGA64 PODCAST 311 IS A HIT! SO IS "CREATURES (FOR A WHILE)"
Check the charts. I'm right. 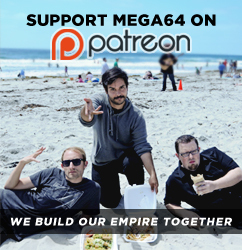 This week, we bring you Mega64 Podcast episode 311. It's a very special tribute to the musicians behind the 311 empire, especially "P-Nut." Oh and we also talk about video games. Whatever. Watch below or listen to the audio version here. Sorry this went up a little late- we had some computer failure, which always slows things down a bit! But now we're leaving our laptops behind and heading to Anime Expo and RTX (I guess we could have still brought our laptops)! All the info on both shows are at this link. See you then!